Find your keys before the time runs out! Press the SPACEBAR/JOY BUTTON 3 to extend your arm, and release the button to grab and then retract your arm. A game made for fortunepalace's "GONE IN SIXTY SECONDS" event right here at Glorious Trainwrecks. Created with Clickteam Fusion 2.5. Music by playonloop.com. Sound effects created by me in bfxr. If you have a suggestion for an item to add under the couch, just leave a comment here and I'll do my best to add it in the game. EDIT: fixed some sound bugs and made it so the game isn't completely impossible to "win." 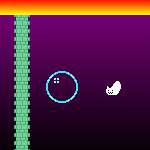 Welcome to RUN LIKE HELL, a game made in less than 24 hours for The Arbitrary Gamejam in October 2013. You are a little soldier running away from the enemy through the desert. Use the ARROW KEYS to move from the bottom to the top. You will face off with ravenous condors, irritated scorpions, malicious archers, and even pointy rocks! Do your best to acquire the achievements (can you figure them out?) and make a nice n' high final score. Thanks to Brendan for hosting the October gamejam. Anabasis was my inspiration. RUN LIKE HELL was made with Multimedia Fusion 2. Background music from the NES games Rush N' Attack and Demon Sword. Other sound effects created with BFXR.